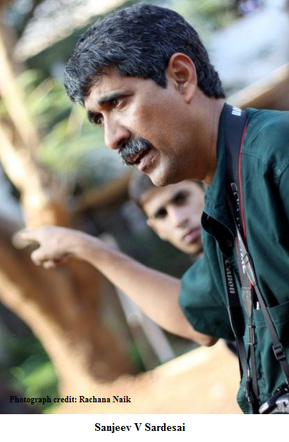 Sanjeev Sardesai is an unusual amalgamation of the educational qualifications of a botanist, the profession of a graphic designer and the passion of a historian. The latter has motivated him to start two groups called Hands on Historians and Sanscritic. In the year 2002, after working for nearly two decades in the hotel industry, Sanjeev gave up his position as a general manger. This was because he realised that tourism was virtually dead. ‘Today after thirteen years of leaving that industry, I still stand by my statement that there is no organised tourism in Goa,’ says Sanjeev, who believes that tourism is the urge of people to travel from one destination to another to discover the culture and heritage therein. So what could our State hold that stokes this desire?! Sanjeev decided he must find out for himself. There is tangible (visually perceived) and intangible (experienced) heritage. Hands on Historians is a forum focused on being a practical historian while Sanscritic (sans – without, critic – criticism), which has the catch phrase of ‘The behind and the beyond’, is mainly about eliminating false perceptions and understanding of customs and beliefs held dear by the natives through amicable debate. Sanjeev tells a story about a Brahmin who began tying up his cat that used to lick the milk required for his daily pooja. This continued as a routine even after he married and was witnessed by his son. Later his son did the same…tying up the cat before he began his pooja. One day the cat died and the son borrowed the neighbour’s cat to fulfil what he believed was the requirement to conduct his pooja. Sometimes our attitude towards traditions is much the same. We forget the origin of the belief or custom but carry on with it however senseless it may seem in the present scenario. ‘Time creates memories. Whether they are memories of the heritage of the land, family or anything else, they are very important for survival,’ says Sanjeev. Our ignorance of Goa’s historical structures is evident in the complete lack of awareness by the residents of the area of a monument that is located near the O’Coqueiro circle in Porvorim. The 105 year old monument sports a plaque that says that the land at the particular point extending to Mapusa was donated by the Serula or Socorro comunidade to construct a road in 1910. It was refurbished in 1935. The small white monument also gave the area its name of Guddiakode (guddo means cannonball), because of the cannonball shape on top of the monument. Goa as a tourist destination receives about 30 lakhs of tourists annually, which is considerably more than the resident population. From the times of the Mauryan Empire, Goa has been an attractive proposition to various dynasties along the way. The Mauryas in Goa, although under the supremacy of Chandragupta Maurya, had their unique identity as the Konkan Mauryas. After the Mauryan decline, there was a host of dynasties such as the Bhojas, the Kadambas, the Bijapuri Sultanate, etc. In 1510 the Portuguese took control and were not ousted till 1961. This area, which was declared the 50th state of India in 1987 on the 30th of May, is peppered with history and culture that reflects its many elements of different rulers, especially the Portuguese. However, the image that most tourists have of Goans is that of a people eternally drunk on feni, musically inclined, and colourfully garbed in a land of coconut trees and fish. This is an image that needs to be altered. Sanjeev’s notion of tourism changed when he visited the UK to participate in the World Travel Market. Here he encountered the Ravens of the Tower of London and learnt of the legend of the downfall of the monarchy with the death of the six ravens. The ravens were marked with different coloured rings and these were used to identify the birds. Detailed information was provided about the birds in brochures. This approach is unlike the self-appointed guides that turn up to provide information (or misinformation) at Goa’s heritage sites. At the Tower of London, Sanjeev found the names of members of royalty that were beheaded there. In contrast to this, he points to a structure near a pavement in St Inez, Panjim, where the structure is dutifully painted every year by the Panjim City Corporation following All Souls Day and on the occasion of Tulsi Lagan but no one has any knowledge of what it stands for. The rest of the year dogs urinate on this stone structure that has icons carved on it and dates back to between the 7th and 10th century. Sanjeev laments the lack of dissemination of information in Goa which leads to such apathy towards historical monuments. 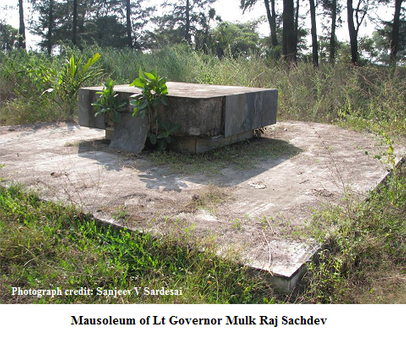 Other edifices of such historical significance as the mausoleum of the 2nd Lieutenant Governor of Goa Mulk Raj Sachdev have constantly fallen into a state of disrepair. This is an extremely lackadaisical attitude towards monuments of note which is not witnessed in countries in Europe and North America. Recognition of the worth of our heritage will empower our people. Unfortunately this does not seem to be happening. Sanjeev says, ‘Tourism in Goa is by default not by design.’ The genesis of tourism in Goa is attributed to the advent of the hippies post World War 2. In Goa they found a haven where there was no interference from the locals and cannabis was available with impunity. The State animal of Goa is the Indian Bison; the State bird is the Ruby Throated Yellow Bulbul; the State tree is the Matti tree; the State handicraft is Divaj (a religious five armed lamp used by ladies in processions. Lamps were a requirement in the days of no electricity) – facts of Goa that its own inhabitants are mostly unaware of. Goa is intrinsically linked by legend to Parashurama, the 5th avatar of Vishnu, who is said to given given rise to the land of Goa (the Konkan region) by shooting an arrow into the sea. Other hidden treasures include the 3500 million year old trondhjemite gneiss rocks that are found at the south end of Palolem beach. Dovornim is a structure found in Goa that allowed people to rest their bags and themselves for a while before setting off again. 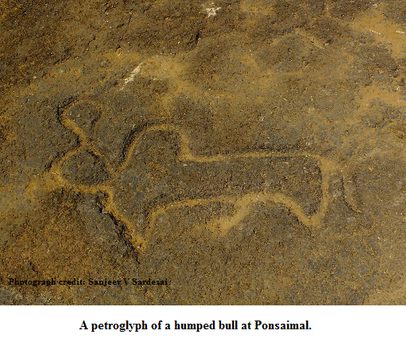 There are Cain circles in South Goa which were used by religious cults. These are just a few examples of Goa’s vast history and culture. ‘The first step to saving your heritage is understanding it and knowing where it is. If you don’t know where it is, what are you going to save?’ says Sanjeev who lectures on Goa’s heritage at educational institutions in the effort to gird the next generation with knowledge and pride in their heritage and in their land.